Reuniting the Rubins, a comedy from the UK, is the only full-length comedy among more than forty films included in the Washington Film Festival, which opens in the nation's capital on December 1, running through December 11. 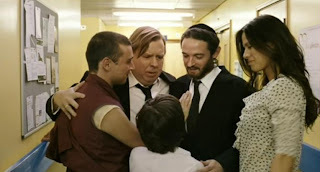 Here's a synopsis: Lenny Rubins, (Timothy Spall) an up-tight lawyer, has to put his dream retirement on hold when his ailing mother (Honor Blackman) emotionally blackmails him into reuniting his estranged children for a Jewish holiday. They may be peas from the same pod, but in Lenny's eyes his grown up children are certainly not from the same planet: a survival-of-the-fittest hard-nosed capitalist (James Callis), an outspoken eco-warrior committed to the cause (Rhona Mitra); an outer worldly Buddhist Monk; and to cap it all a bible bashing born-again Rabbi! They might not see eye to eye, quarrel, fight, but they are still family and it is going to take a whole lot of soul searching and sacrifice for all involved to come together in this heart warming, family comedy that will have you thinking of your own family with a smile. Keep an eye out for this film as it makes its way through Jewish film festivals around the country, and eventually gets released as a DVD and becomes available on Netflix. In the meantime, check out the trailer. Enjoy!